This pair of mittens was left in my care by my sister, who, living in Darwin, has no need for any kind of glove or woolly garments! They are very precious to her, as she bought them many years ago while living and working in remote Siberia. They were made by an elderly woman living in the nearby village who knitted to supplement whatever income she received from state or family. 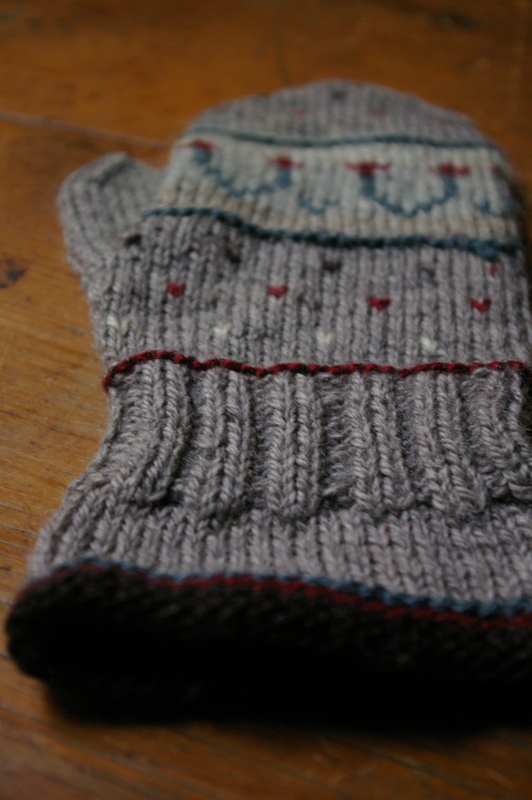 No doubt, they helped my sister get through the winter with hands frostbite-free, so I have only gratitude for the knitter! They are large, which makes me think that they are designed to be worn over a smaller pair (to have to wear two pairs of mittens is so foreign to me! 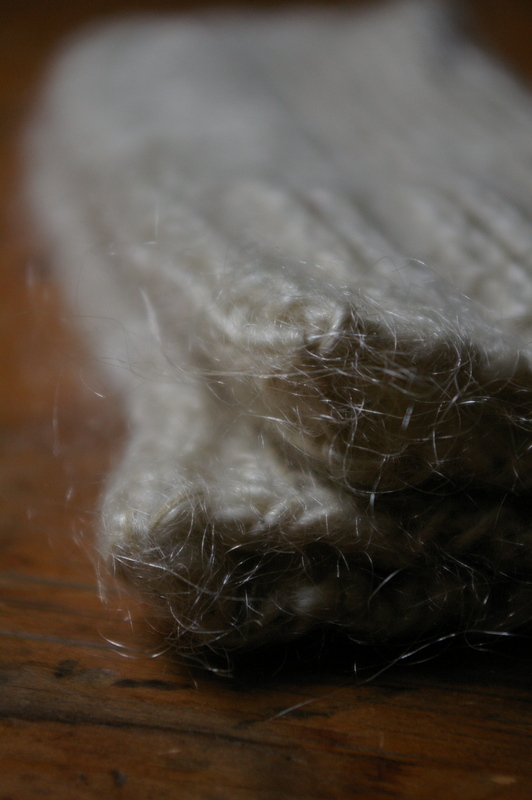 ), and are made of six shades of commercially-spun yarn. I really love the simple flower motif, as well as the use of single rows of garter stitch to divide the sections of colour and texture and the cuff that expands to cover the sleeves of a coat or jumper. 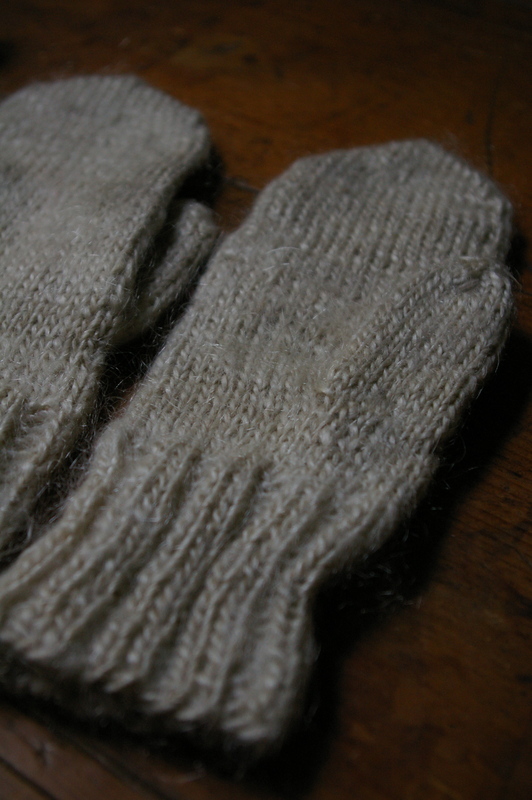 These are the smaller mittens that my sister wore underneath. Knitted by the same villager, these are made of her handspun yarn- which, according to my sis, was sheepy, rather than the goaty mohair that it looks like. Look at that halo! 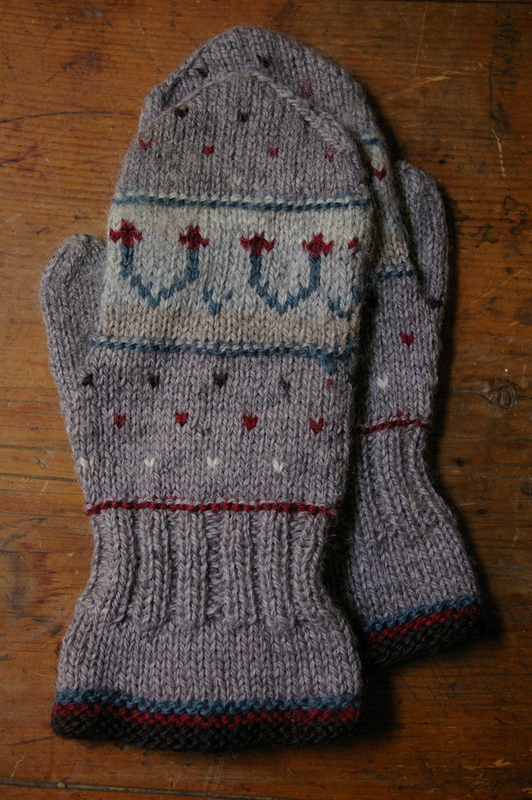 Although knitted in a relatively hard, smooth, worsted-style yarn, the mittens feel surprisingly soft (and warm) when I put them on. The beauty of these is definitely in their plainness and creamy lustrousness. Just for the knitting geeks, it looks like she used a longtail cast-on ; ) I’ve also been wondering what breed of sheep she may have got her fibre from… despite the plethora of info in the fleece and fibre sourcebook, it doesn’t mention any breeds from this part of the world that fit the fibres we see here. Anyone have any idea what it might have come from? 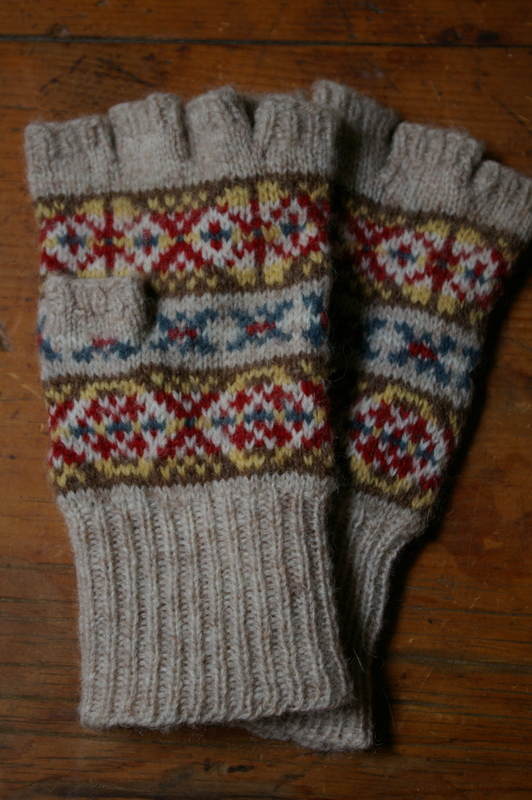 These fingerless gloves I bought in Shetland two years ago. 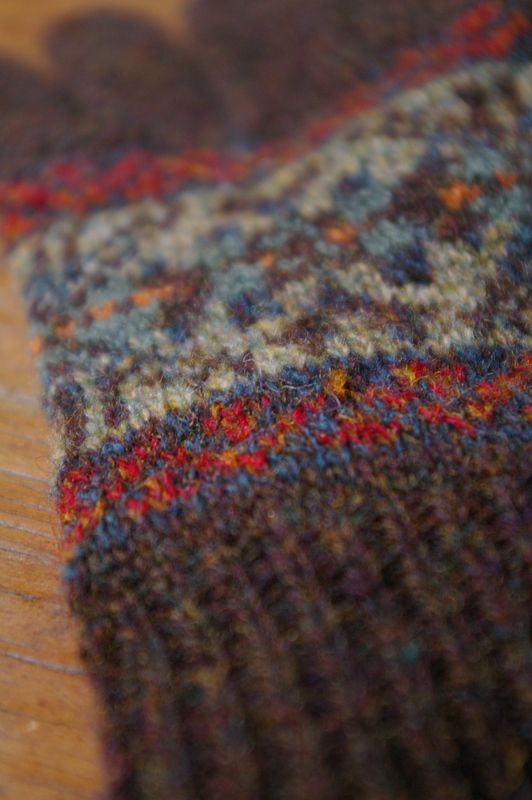 There was simply no way I was going to get out of Shetland without taking some of their beautiful colourwork with me… and I just fell in love with the vintage colours in these. Interestingly, the ribbed bands (cast on with a tubular cast-on ) were knitted flat- can you see the seam in the above photo? Initially, I thought they might have been done that way to save time… but, given the Shetland knitters renowned skills in working in the round, that doesn’t make sense to me. I’m wondering if perhaps the bands were knitted on a hand-operated knitting machine and then put on double-pointed needles for the colourwork? Anyone know? When visiting the textile collection at the Bod of Gremista, I heard a bit of tut-tutting from other tourists when the curator began to speak about the use of hand-worked machines by local knitters but I can certainly understand why production knitters all over the world use whatever tools they have, allowing them to spend the bulk of their energy and time on the more intricate parts of a piece. It would be lovely to have everything done in the old way but it is not always possible- and certainly not always viable for the maker. Anyway, as I said, I’m not sure if that is what’s been done here but it is an interesting thought! 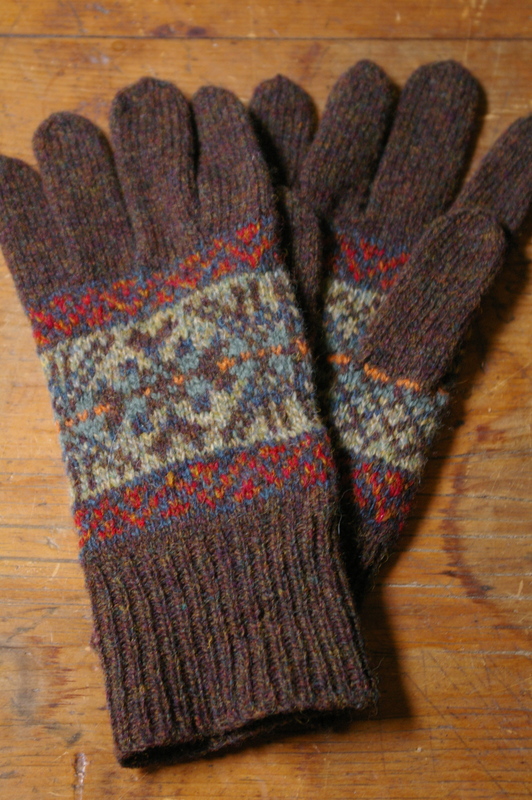 And some gloves also made in Shetland but bought in Stromness, Orkney. I bought them for a friend but… in the end, I couldn’t give them away, despite the fact they are a bit big for me. They are surely knit for the tourist market (as I guess most things are) but those colours are insanely rich and beautiful. More than the individual shades, what really gets me with these is the combination of colours; I would never have thought of pairing the hot orange and red with this rich but muted palette but that is what makes them come alive! Fabulous! And here is a peek of the fingerless mitts that I designed for a class introducing participants to Shetland lace construction methods. 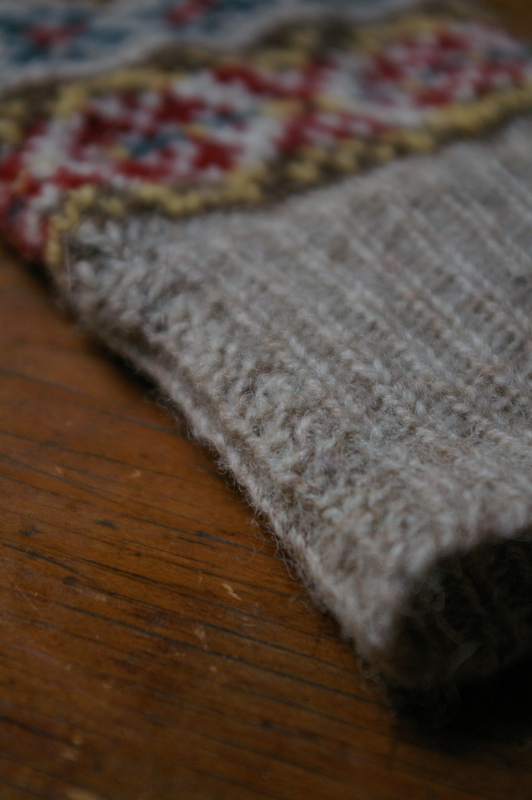 I wanted to show them the amazing ways Shetland knitters started and finished their work to minimize casting on and off and to lend elasticity and stretch to the piece. I’ve written up the pattern to put on Ravelry so won’t go into much detail here but they are knitted in one piece in three distinct sections using Shetland methods. Made using quite a few new techniques if you are new to this tradition (as I am! ), these are also very comfortable to wear as there are no tight edges at the wrist or around the fingers. This entry was posted in family, knitting and yarn, teaching, travelling and tagged colourwork, gloves, mittens, Shetland, Siberia on April 25, 2012 by admin. Beautiful Jules! And so nice that the chilly mornings have arrived, I got to wear a scarf today. Thanks, Tony! I know, I love this weather too- yippee for knitting and wearing woollies! These are all so beautiful! 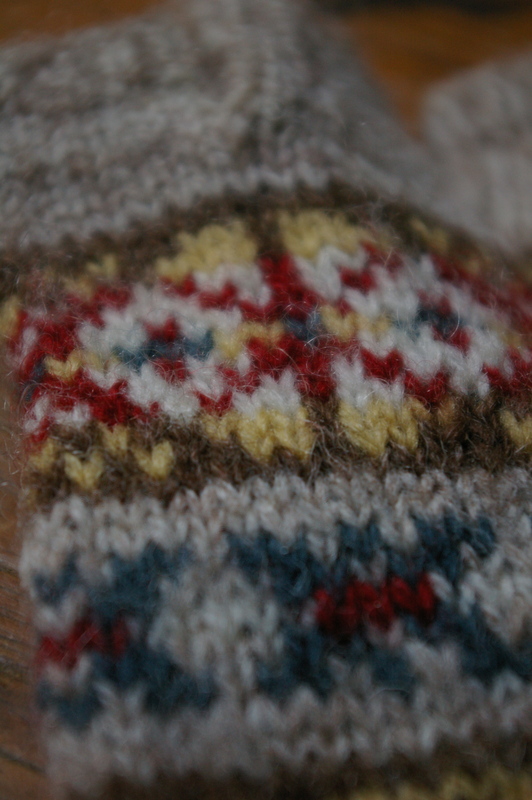 I love reading the stories behind well loved and worn knits! I hope you don’t mind if I pin a few of these to my Pinterest…. 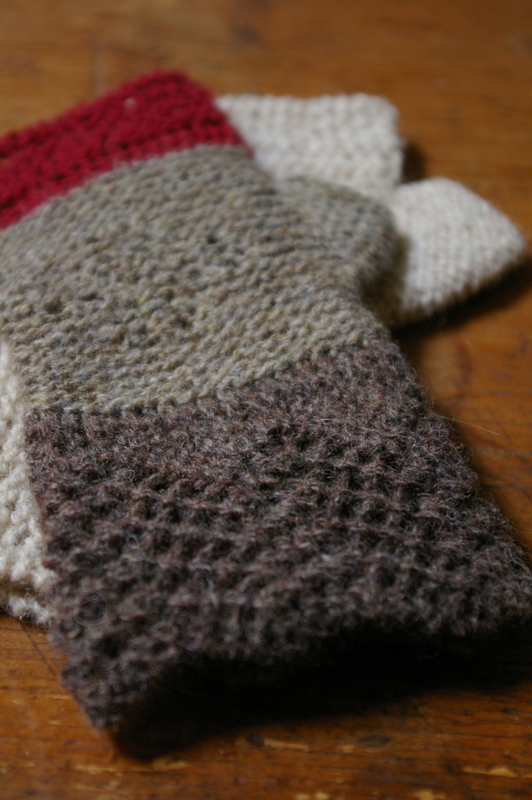 Such lovely handknits for hands! Is it ok with you that I “pinned” your first photo of the Siberian mittens to Pinterest? I gave credit both to your blog and to the Siberian knitter. I wanted to add them to my knitting inspiration pictures. I love the simple colorwork. That’s a lovely collection of mitts and gloves you’ve got there Jules, I really like the stories behind them. Oh they are all very lovely mittens, you shall never have cold hands. 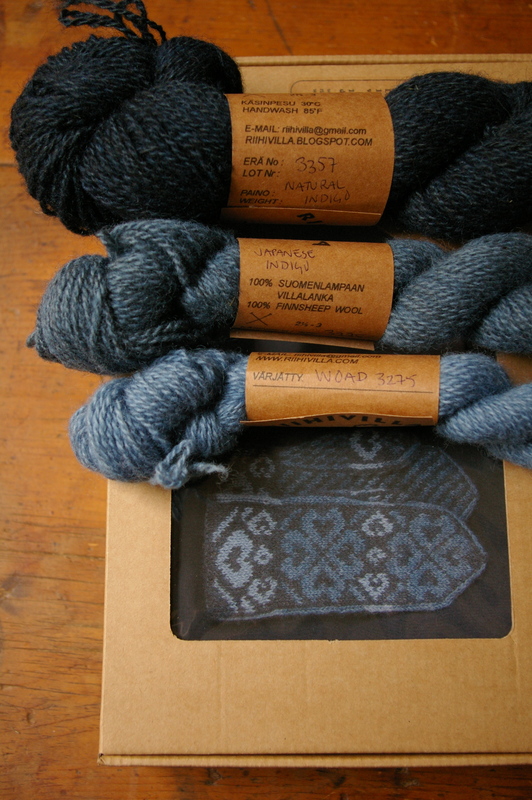 Your Shetland mitts look very chic too, I can’t wait to see the pattern up on Rav.